The article about Levi Yitzchok of Berditchev (1740–1809), at Wikipedia, says: Reb Levi Yitzchok was known as the "defense attorney" for the Jewish people, because it was believed that he could intercede on their behalf before God. As he does in this song. 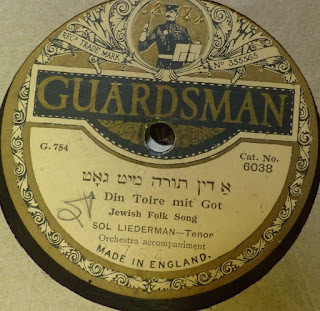 This version by Sol Liederman is spelled "Din Toire mit Got." A din-toyre is a case before a rabbinic court. The title has been translated as "Lawsuit against God" or "A Plea to God." The poem/prayer has been put to music at least three times, the most famous being this setting by Leo Low (1878-1962). The transliteration used on his sheet music: A Din Toire Mit Gott. There are probably a dozen versions of this song available on line so, needless to say, you're not getting one from me. However, I do have a lead sheet for you with transliteration and translation. No matter what happens, it is: "Say to the Children of Israel." No matter what happens, it is: "Speak to the Children of Israel." How many other peoples are there in the world? What do the Russians say? "Our csar is a csar!" And what do the Germans say? "Our king is a king!" "O King who sits exalted on his throne." Hallowed and magnified be the name of God."